Prepare a setup for your celebration party on Easter. Gift boxes, Easter eggs, Kinder mini mix, and many more products are in the Easter candy-treat range of Big W Catalogue on the first part of the sale. Save $1.50 on Cadbury or Mars Easter gift boxes. Tall Easter bunnies are available in this category. Buy Cadbury dairy milk Easter bunny for only $5. It's a 26cm and 250g chocolate bunny. You can personalise Cadbury 28-pack Mega Easter egg tube. Give your name to it. Easter egg tube is an exclusive Cadbury product of Big W.
Find a wider range of Easter treats and candy packs on pg 2-3. Lindt, Red Tulip or Cadbury Chocolate Easter bunnies will cost only $4.50! You can find cute baskets and buckets for these candies. Kinder Easter Maxi mix with a plush toy is gonna cost only $15. Big W Catalogue covers premium Easter egg crates that will save your $5! Block chocolates, big Easter chocolate eggs, colourful variety of Easter treats are a way to celebrate traditionally. Don't miss out the future Big W Catalogue deals. Follow our Facebook page to get them all. Subscribe to get emails. See many more than these on the catalogue. Big W Catalogue offers a lower price range for all of these items. Follow the Facebook page or subscribe to get emails. 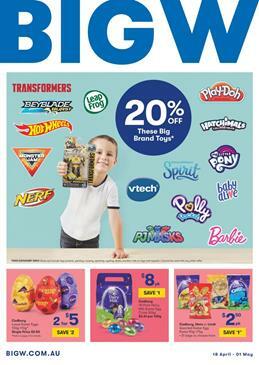 Perfect toy gifts for Easter are on the latest Big W Catalogue. Nickelodeon toys with a 20% discount are promotion in this catalogue. Buy TMNT basic figures for only $12 to save $3. New toys are gonna be also in the Easter toy range of the store. Hot Wheels colour shifters science lab is a new toy. Check out the first page to see its price. Hot Buy Hatcimals colleggtibles will cost only $25 and it's an exclusive. Buy board games like Jenga for catalogue prices this week. One of the best activities is to set up scenes with toys. You can do that perfectly with awesome LEGO sets with the theme of awesome movies and characters. LEGO Technic and City sets are available with the catalogue prices on pg 3. Buy LEGO City fire plane with water cannon for only $49! Get active with scooters and bikes. Razor A Scooters will cost only $39 at Big W this week. If you like racing cars, I can definitely tell that you will probably like Hot Wheels cars. 10-pack vehicles, action track set, and more with prices that are lower after promotions. Find Tonka construction vehicle toys, micro wheels, and more on that page. LEGO Friends Mia's House will cost $78 that is a $21 saving and many more like these are available. Subscribe to the newsletter to get emails. Follow our Facebook page for the news about these deals. Also, see Barbie's 60th-year collection of dolls and packs of toys. Easter will be so much fun with many deals from toy sale catalogues like Big W. Find other toy sales on Target, Kmart, and other department stores. Join the adventure of the most popular characters from cartoons and toy world. Big W Catalogue Easter toys are worth seeing. Buy collectible toys from the Big W toy sale catalogue. LOL Surprise! bubbly surprise is only $49 and it's $10 saving this week. More brands like Pikmi Pops, Poopsie Cutie Tooties, and Hatchimals are major deals from this collectible section of the Big W. Imagine a path which has a surrounding of these characters only. Imagination power of kids is so strong that they can cream of what we can't even think of. But usually, they can stick with the popular characters. To let them think intelligently and creatively, increase the number of types of toys that they have. Big W and similar department stores can have great toy sales for you to save more. Also, see their entertainment range of products in the recent catalogues. Clothing deals are also available for kids on pg 12-13. Grab those price drop deals on sweatshirts, trackpants, B Collection, and more. Harry Potter clothing is also interesting subject in the catalogue. Also read about the Big W Easter Sale. Follow the Facebook page of ours and get emails via subscription which is completely free. Buy Easter chocolate bunny at Big W. Cadbury, Lindt or Red Tulip Easter bunnies are only $4 ea. Enjoy the celebration with the traditions. Easter egg is one of them. Cadbury loose Easter eggs will cost 2 for $5 with Big W Catalogue deal. Find interesting treats for Easter from the catalogue. Personalize Cadbury Mega Easter egg tube with your name for only $20. It's a 28-pack Easter egg tube. An exclusive of the store. Buy bags of sweets for the celebration of Easter. You are able to purchase 21 bags of candies of Cadbury, Lindt or Mars for $3/pk. See the extensive range of Easter bunnies, eggs, healthy choices of Sweet William dairy-free chocolate Easter egg. Discover many new products there. Stargift 4-pack candy eggs will cost $5/pk. Decorate your place with beautiful Easter traditional accessories including bunnies, storage jars, Easter wreath. Buy more snacks, candies, and stuff for half prices on pg 8. There is also a toy sale in this Big W Catalogue. Don't miss out that and subscribe to get emails.